Using Windows Explorer or File Explorer in Windows 10, Windows 8.1, Windows 8, Windows 7 and Windows Vista is sometimes annoying and confusing as the folder views settings and folder types customization is not working consistently. Folder views which determines which view, such as tiles, details, list, small icons, medium icons, large icons or extra large icons, that users is using to browse files and items in Explorer window, while folder types set the template which shows kind of folder and its related commands and buttons in toolbar. However, the implementation in Windows is buggy, messy, confusing and abnormal. 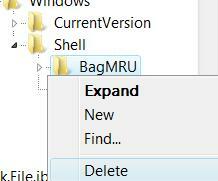 When opening a folder within the Explorer, Windows automatically determines the folder type. If the folder contains image files such as .JPG, .PNG or .GIF, the folder will be displayed as “Photos and Videos” or “Pictures” template type with thumbnail icon view, tag and rating columns plus “Slide Show” command button in task toolbar. However, when the folder no longer contains any pictures, the folder type is not reset. System drive root folder (typically C drive) is set to a folder type such as Documents, Pictures and Movies, Music Details or Music Icons without any reason, or when you put in files with triggering file types temporarily to the system root, causing Windows to recognize the root drive as particular type folder, for example, Pictures folder. However, when the files are removed, the setting is not removed, and users cannot customize the root folder to reset or undo the changes. In folders that contains only documents or .exe exectuables, and do not have any MP3s and songs, Windows erroneously assumes it’s a Music folder, complete with Explorer task bar with “Play all” command and artists, album, #, genre and rating columns. Some special folders such as Windows and System32 have their folder type templates go haywire, set as Music-type or Picture-type folders and other media folder, resulted inappropriate Explorer Bar tasks, and users unable to change the settings as there is no Customize tab in folders’ properties. New folders created automatically assigned and defaulted to a particular type folders, such as Pictures folders or Movies folders. Folders that have been configured to be a specific folder type suddenly changed to another template such as Music template or other state even though there is no changing of file type or media. Unable, cannot and impossible to apply same folder view to all folders of same type by using “Apply to Folders” button in Folder Options or Folder and Search Options. Folder view changed to different selection and scrambled even though you have chosen your prefer one. Change view in one folder affects folder view of another folder. For example, set folder view of Documents folder to “Large Icons” and close the window. Then open up C: drive root folder, which previously is been viewed as “List”, also also been reverted and changed to “Large Icons”. The reverse is also true, where changing folder view in system drive root folder back to “List” or “Details”, the Documents folder Explorer window will also be shown in “List or “Details” view. Then “linked” folder views problem between Control Panel, “Uninstall or change a program” module and “Uninstall an update” module with a random folder, where changing view setting on folder will automatically ‘link’ and reflect in Control Panel window, and vice versa. “Reset Folder” in Folder Options does not return folder view for all folders with this template type back to the default view settings. Enable “Remember each folder’s view settings” or check “Launch folders in a separate process” in Folder Options does not work to help solve the folder view mysteriously changed problem. Windows unable to remember any views or types settings. Users customize folder icons to display picture using folder pictures option, however, the selected pictures are showing up in other folders icons which never been changed. Problems listed above are just some frequently encountered symptoms in Windows, and there may be more weird or not so obvious issues related to Folder Type and Folder View. The easiest solution all Folder Types and Folder Views mess in Windows is by reset all settings and customizations related to Folder Types and Views to revert back to out-of-the box post-installation defaults. Try to use Reset Folder in Folder Options (open by clicking Organize -> Folder and Search Options or View -> Options (depending on version of Windows) and then go to View tab) before trying registry hack below. Registry tweak below will delete and reset all folder view and folder type settings to default and clean state by rebuilding the related registry key, so that everything start fresh again from scratch. All remembered folder settings in Windows Explorer or File Explorer for view state, window position, sort order, column information, folder type, toolbar toggles, and search result views will be lost, and reset to the original defaults. This will correct any corruption that occurs, but all related customizations will be removed and deleted, thus ensure that you make a backup of the registry keys before proceeding to the steps below. 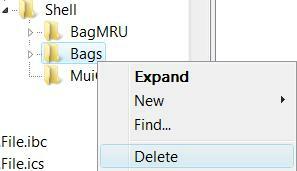 To backup, click on “Export” before deleting. Click Continue or Yes on User Account Control dialog prompt. After logged on, open Windows Explorer, go to Folder Options‘s (Organize -> Folder and Search Options) View tab, and make sure the Remember each folder’s view settings is checked (not applicable in Windows 10). To ensure that any changes to Folder settings in Explorer window, close the Explorer window after changes to save the settings. Windows will only remember the state of folders of the window is closed. For 64-bit (x64) Windows editions, there are also traces of folders settings in the below registry keys. However, any changes to the registry keys mentioned above will be duplicated to the below keys, and the reverse is also true. All folders will now have the default view of Windows as if right after installation with all problems gone, where mostly will be in “Details” view. Some system folders such as Network, Computer, Control Panel, etc, will be displayed in their default view normally as “Tiles”. All folders including special system folders will show the right tasks and commands, and most regular folders now use “All Items” template comes with more logical default columns in Explorer.